Entertain guests with these rainbow vermicelli crocheted coasters. The bright and fun design will definitely perk up the atmosphere! Make a bunch in your favorite colors for a personal touch. They also make for a great housewarming gift! In fact, this pattern is a perfect project for advanced beginner crocheters to work on. They will definitely enjoy making these fun and rewarding items. Once finished, the crocheted coasters should measure approximately 4.5 inches in diameter. In metric measurements, each completed rainbow coaster should have a diameter of around 12 cm. This crochet pattern is another wonderful design by Zelna Oliver. In fact, you can access the FREE pattern for these crocheted coasters from her website, Zooty Owl Cards. 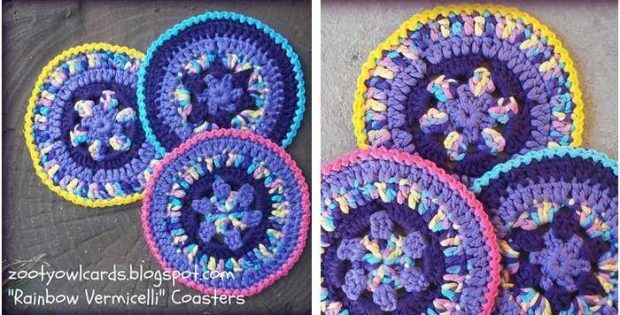 To access the FREE pattern for these colorful crocheted kitchen must-have, please click on this link: Rainbow Vermicelli Coasters Pattern. Featured image: Zelna Olivier – thank you!